December 12, 2017 / Matt Smith! "Bed" originally appeared in the University of Victoria's Martlet newspaper. October 24, 2017 / Matt Smith! "Vital Signs" originally appeared in the University of Victoria's Martlet newspaper. October 20, 2017 / Matt Smith! Emma and I are still shopping for our new apartment in Al Ain. October 18, 2017 / Matt Smith! We attempted a walk to explore Al Ain, but it didn't last long until we had to seek refuge in the air conditioned Al Ain Mall! September 15, 2017 / Matt Smith! Emma and I left Kuwait over a year ago to move to Canada where I concentrated on comics and she went to art school. After a sometimes hectic summer living with my parents, we are off to our latest adventure: life in the United Arab Emirates! September 11, 2017 / Matt Smith! My wife is Scottish. Very, very Scottish. August 29, 2017 / Matt Smith! Today's comic originally appeared in the Camosun College Nexus Newspaper. This was my 18th and last comic to be published in the Nexus. My first comic they published was the instant classic Trust. Huge thanks to publisher Greg Pratt for giving Smith vs Smith a home in the paper for this past year. If you're living in Victoria, you can still read Smith vs Smith in the University of Victoria's Martlet and you can always read Smith vs Smith right here or follow on Instagram, Twitter, Facebook or Tumblr. Emma and I are in the process of relocating to the Middle East. Once we are settled and my office is all set up, expect comics to be released more frequently. In the meantime, why not go back and re-read all 130 Smith vs Smith comics from the start!?! August 22, 2017 / Matt Smith! This week's comic is a sequel to last week's Renovations 1. After being on the road for six comic conventions across British Columbia, Emma and I were excited to relax at my parents' house in Courtenay, BC, but they had other ideas. Make sure you scroll back to read all about it! See you in a week for another comic! Emma and I are in the processing of moving back to the Middle East and once we are settled, expect comics to be published with more frequency! July 11, 2017 / Matt Smith! 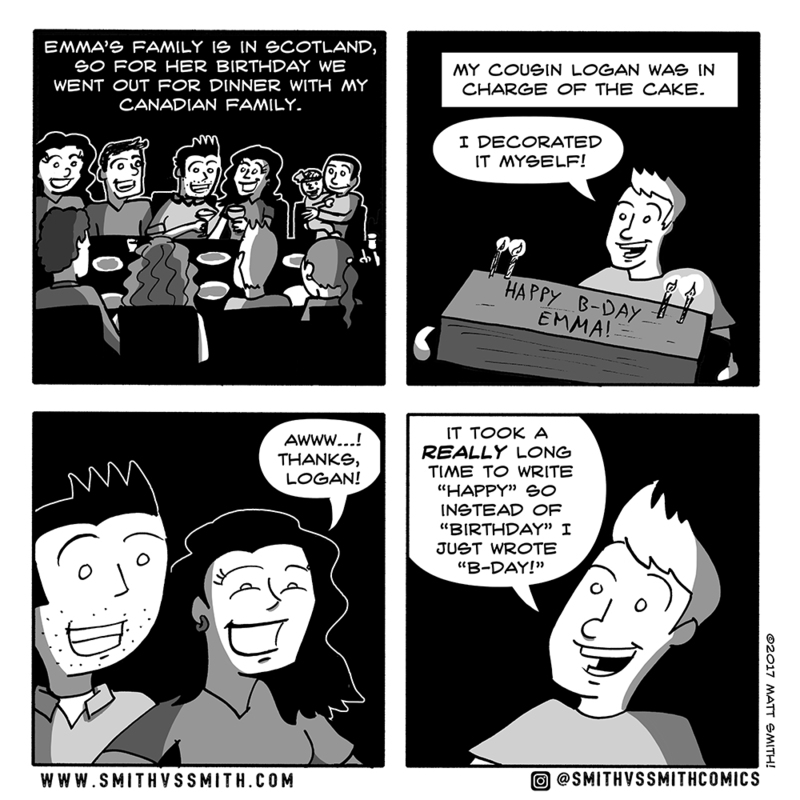 Today's Smith vs Smith comic originally appeared in the University of Victoria's Marlet student newspaper. If you live in Victoria, keep an eye out for issues of the Martlet to see Smith vs Smith comics early! Update: I STILL haven't seen Walk the Line, but funnily enough: it played a crucial role in the Smith vs Smith Superior Sibling Challenge Cup. May 23, 2017 / Matt Smith! This comic originally appeared in the Camosun College Nexus newspaper. May 02, 2017 / Matt Smith! Emma and I are leaving Victoria. We moved to the island in the summer of 2016 so I could focus on comics and Emma could attend art school. The time has flown by! I won't reveal where we are moving to yet, but I CAN tell you where to find us this weekend! Emma will be joining me for two comic cons this week: On Saturday May 6th (Free Comic Book Day!) you can find us at the Curious Comicon in Nanaimo, BC. Sunday, May 7th, we will be back in Victoria at Cherry Bomb Toys' Ultimate Hobby & Toy Fair. Come by and say hi, and get some comics! April 27, 2017 / Matt Smith! April 25, 2017 / Matt Smith! This comic originally appeared in UVic's Martlet. If you're in Victoria over the summer, keep an eye out for more Smith vs Smith comics every month in the Martlet! You can see me next at the Curious ComicCon in Nanaimo on May 6th and then the Ultimate Hobby & Toy Fair in Victoria on May 7th. Come by and say hi! April 18, 2017 / Matt Smith! Today's comic originally appeared in Big Time Funnies out of Phoenix. This is the second comic of mine to appear in Big Time Funnies. If you're in Phoenix, keep an eye out for this free all-comics paper featuring some hilarious comics like #parenting! April 12, 2017 / Matt Smith! 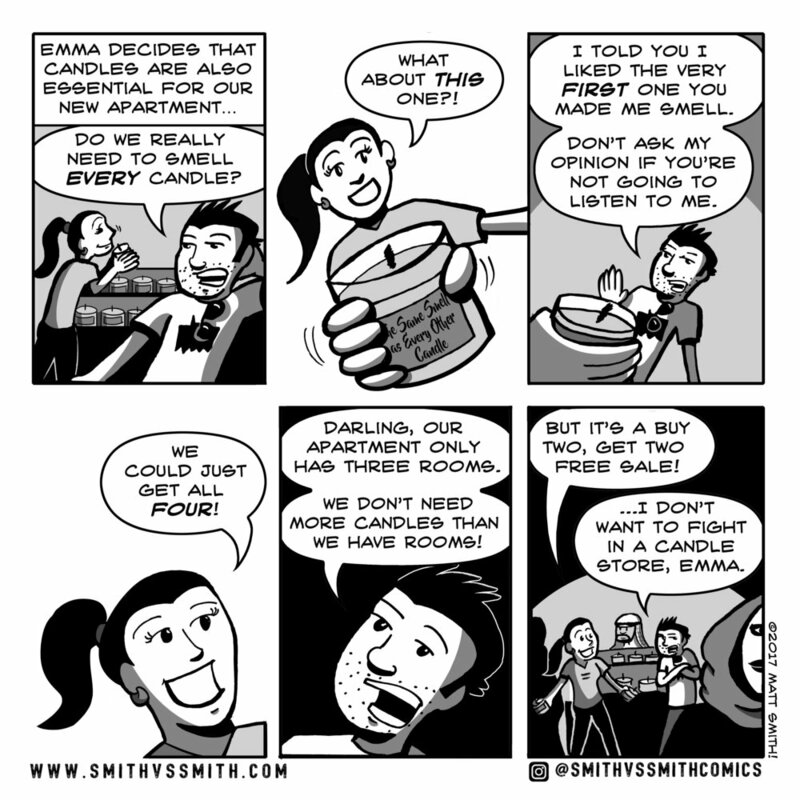 This is the 101st comic I've published on SmithVsSmith.com! I've been slowly updating my website so if you haven't read all 101, check out my newly redesigned archive page or start at the beginning and tell me how crappy my art used to be! This comic is the third in the "Matt's Birthday" saga. Go back to the beginning and read them all! I had an amazing birthday (they've all been amazing since I've been with Emma, honestly). Emma spoiled me (she got me the Lego Millennium Falcon)! April 10, 2017 / Matt Smith! After wrapping up the multi-part epic "Emma's Birthday" we are now starting a three-part epic about MY birthday! If you know someone with an upcoming birthday, why not get them something from the Smith vs Smith store? March 27, 2017 / Matt Smith! March 24, 2017 / Matt Smith! I borrowed some comics from some cartoonist friends. Check out Axel's Roach Town, Geoff Munn's #parenting and Richard Pettitt's comics and for more! March 20, 2017 / Matt Smith!